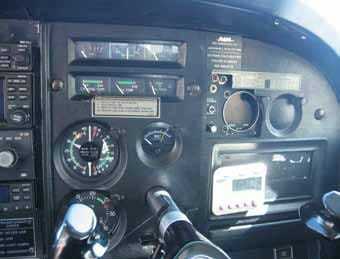 10K Run on a TP206D | Tennessee Aircraft Services, Inc.
I’ve written about aging aircraft issues several times before, but the definition of age has always keyed on calendar time. High flight time combined with high calendar age has some different effects on an airplane that one might not consider. We’ll explore some of the areas noted on a TP206D with about ten thousand hours of flight time currently in our shop for an annual. There are plenty of examples of high time single engine Cessnas, but most of us rarely get to see them. These planes aren’t your typical weekend hamburger go-getter. They’re hiding out flying checks at night, making air taxi flights in the Alaskan bush, or loitering around for endless hours observing some illegal target from miles away. These higher flight time planes also are rarely seen at your neighborhood maintenance shop because they usually are cared for by inhouse company mechanics. Assuming a typical Cessna flown by a typical Cessna owner flies about 150 hour per year, then 10K hours takes over sixty-six years. Our sample 1969 TP206, presently being used as a photography ship, averaged about 240 hours per year getting to the 10K hours mark in forty two years. There are many examples of Cessna singles with 20K hours that are still doing well. If you count an airplane’s age by calendar time, then you are expecting to find general deterioration. Counting age by flight time focuses the discussion on items that wear from usage. Lots of calendar time and flight time is a double whammy. Flight control cables, whether stainless or galvanized, stretch and wear with use. At each annual or 100 hour inspection, the flight control cables must be checked for proper tension and tightened as needed. Once the cables have been adjusted to the point that the cables meet in the middle of the turn buckle, it’s time to replace some parts. You may get by with just replacing one cable if it’s short enough and doesn’t cause a rigging problem. Speaking of rigging, all these years of turn buckle adjustments has likely not been followed up with checks of the flight control rigging. We often think of rigging only when the plane doesn’t fly straight or won’t make book speeds. In this case, flight control rigging should be checked to ensure it meets the proper deflection travel. High flight time planes often have control deflections that are excessive in one direction and below specs in the other. Push-pull controls, like engine and air vent controls, have a couple of common wear modes. The interior cable moves back and forth inside some type flexible sheath. As the assembly wears, the friction scrapes material off of the sheath interior walls or the cable or both. Over time, the resulting extra space between the center wire and the sheath means the cable knob can move a significant distance before the part on the other end actually moves. All the wear particles can be trapped in the sheath and eventually bind the inner cable making it difficult or even impossible to move. The turbo charger oil supply is provided by a flow directional check valve and an outlet check valve. Cessna recommends these check valves get replaced every 1000 hours. Continental Motors would certainly want these replaced at least during every engine overhaul. I often find these valves have been overlooked for a very long time, possibly because they aren’t considered part of the engine when it gets removed for overhaul. They are easy to get to and should, at the very least, be removed, cleaned, and inspected every 1000 hours. A little care and these valves will protect the turbo bearings for a long time. 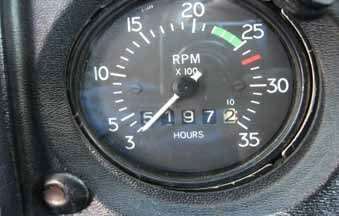 The tachometer is referenced a great deal during every flight. One would assume an instrument used this frequently would be checked for accuracy often. As it turns out, most owners are surprised to learn that their much depended on tachometer is reading about 200 RPM lower than the engine is turning. It probably hasn’t survived all 10K flight hours either. Most tachometers won’t be particularly accurate after about the 3K hour mark. The cowl flap hinges take a pretty serious beating in ten thousand hours, especially the one on the side of the exhaust stack. 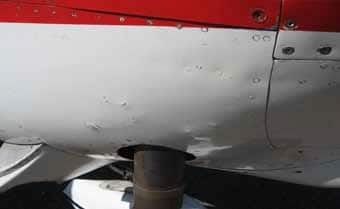 The engine vibrations combined with pulses from the prop and exhaust make for rapid wear on the hinge halves and pin. An easy check is to look for lateral movement between the hinge halves. This is your warning that hinge replacement is needed sooner than later to prevent an in-flight cowl flap departure. Elevator trim hinges use a similar “piano hinge” material as the cowl flaps. A simple check to see if it can be moved left or right lets you know if it’s time for replacement. Losing a cowl flap in flight may not be a big event, but a trim tab departure would likely be the last event. Nose gear shimmy is such a common problem in the fleet the CPA used it as the topic for the first Tech Note and can be found on the website. Repair is often put off until the shaking scares the pilot into action. By this time almost all the probable causes listed in the Tech Note are in full effect. Taking action earlier would allow getting the problem under control and prevent excessive wear on many of these parts. The 200 series planes have rollers mounted on the forward side of the instrument panel to guide the control yoke. There are three rollers on each yoke shaft that are mounted on an eccentric to allow adjustment. These rollers often need adjustment but often get ignored. You can check bearing adjustment and condition simply by moving the yokes from side to side or up and down. If they move enough to touch the edge of the instrument panel, they need work. With this much flight time, the probability of previous structural repairs is high. If doing a prebuy on a high time airframe, one should want to ensure proper documentation exists for all found repairs. If performing an inspection, all old repairs should be intentionally inspected. Being repairs, they are unique to this airframe and not tracked by Cessna inspection check lists or FAA Airworthiness Directives. At 10K hours, it wouldn’t be unexpected for the airframe to be on its tenth or eleventh engine. There are several parts attached to the engine that are actually airframe pieces. Each time an engine is changed, the chance of the new engine going back with one or two of these parts missing increases. The baffling on the engine is comprised of mostly Cessna parts, not Continental. There are small heat shields attached to the induction connector hoses that are also Cessna parts. A small aluminum baffle mounts at the aft inboard end of the oil cooler to fill the gap between the cooler and the base of cylinder #5, another Cessna part. None of these will be on that nice new engine, overhaul or rebuilt or new, when it comes back from CMI (Continental Motors, Inc.). You’ll want to be sure and snag them off the old engine before it gets sent back as the core. In the last 10K hours it is likely several attempts have been made to adjust one or both wings’ angle of incidence by adjusting the aft wing attach bolt eccentrics. Many mechanics don’t realize that each bolt has two eccentrics: one on the front side of the attachment and one on the aft. These two eccentrics must be kept in alignment with each other as they are rotated to prevent binding the attach bolt and introducing unwanted stress. It’s amazing what 10K hours of turning knobs and touching interior placards can do. Some time researching the Type Certificate Data Sheets and the airplane’s Pilot Operating Manual or Pilot’s Operating Handbook will tell you all the placards that used to be on the panel. The plane is unairworthy without them. Placards can make a cluttered mess on an instrument panel but they all have to be there. They must be legible too. In the near future, you can expect some additional inspections to these maintenance manuals. These additions will be in the form of SID (Special Inspection Document). They will describe special inspections Cessna considers mandatory at about the 12 thousand hour mark. Stay tuned. For those of you thinking of using a high flight time airplane, don’t be afraid. These aluminum airframes are incredibly resilient and can withstand decades and tens of thousands of hours of use. With proper maintenance and care, the 10K run can easily be extended to a marathon. It’s pretty difficult to fly ten thousand hours and not have a few blemishes to show for it.